Above the sparkling waves of the Pacific, Monterey Bay Aquarium inspires nearly two million visitors each year to care more — and do more — to protect the health of the ocean. Toward that end, Letise LaFeir, the Aquarium’s California ocean policy manager, focuses much of her energy on decisions made in the state capital, almost 200 miles to the northeast. Drawing from her experience in marine science, ocean policy, education and public outreach, Letise encourages legislative and government officials to keep up California’s leadership on ocean and coastal health issues. We asked her to tell us more about two major issues she’s working on: climate change and ocean plastic pollution. What’s your role at the aquarium, as it relates to climate change? Communicating about climate change, making sure people get it, is a top priority to help drive action on this issue. It’s important, and it’s affecting us right now. Organizations like ours, and the vast majority of scientists, agree that climate change is happening, and that humans are causing it. But we still have hurdles to get over with particular policymakers. There are some who understand, and are looking for solutions and guidance. Others, unfortunately, are still saying climate change isn’t real or isn’t our problem. At a high level, we’re getting certain policymakers to just accept that we’re already seeing and feeling the impacts of a changing climate, and that planning sooner rather than later will actually be a benefit in the long run — even if that individual policymaker isn’t here to see that benefit. Then we help them move from understanding to action. Part of the work we do is putting the experts in front of policymakers to answer very specific questions to help them make and implement their decisions. In what ways are we already seeing the impacts of climate change on the state’s ocean and coast? Burning fossil fuels, like from this gas-fired power plant, adds rampant CO2 to the atmosphere and ocean. A big push for the Aquarium is to remind decision makers that our carbon emissions are profoundly affecting our coast and ocean. The heat trapped by the extra carbon dioxide we emit into the atmosphere doesn’t just warm the air or land; it also warms the ocean, affecting many marine species and habitats, contributing to harmful algal blooms, and having other ecosystem impacts. As the ocean warms, its volume expands, causing sea level rise that threatens coastal communities in California and worldwide. Another important function of the ocean is that it regulates the Earth’s climate, like your heart regulates blood flow. When we burn fossil fuels, we add carbon dioxide to the system, disrupting how the ocean pumps heat and moisture around the planet. That could make severe weather events like droughts and storms more frequent and intense. One of the biggest impacts often goes overlooked: ocean acidification. Some call it climate change’s “evil twin.” The ocean has absorbed about one-third of the carbon dioxide we’ve emitted into the atmosphere. That affects the chemistry of the ocean, making it more acidic. As a result, sea creatures’ shells and skeletons are becoming thinner and more brittle — a major disruption to the marine food web. Last year, Governor Jerry Brown issued an executive order establishing a statewide target to reduce greenhouse gas emissions 40 percent below 1990 levels by 2030. In what ways is California addressing carbon-driven impacts on the ocean? “Rising Sea Levels” by Julie G. is licensed under CC BY 2.0. California plays a leading role when it comes to climate action. The governor’s executive order requires government agencies to acknowledge that climate change impacts are happening now, so they have to plan accordingly. For example, how can we make our coastlines more resilient to sea level rise? Even if we stopped all our fossil fuel emissions right now, we’d still feel the impacts and experience the changes for decades to come. As ocean acidification gains scientific traction, it’s starting to beg for policy action: making sure we have the best available science to decide which areas we should protect, reducing runoff so it doesn’t make acidification worse, those kinds of things. How is the Aquarium helping policymakers adapt existing ocean policies to deal with the impacts of climate change? We’re collaborating with organizations like The Nature Conservancy and the Center for Ocean Solutions to give local cities and counties the information they need as they develop climate action plans and local coastal plans. Warming, acidifying waters are affecting marine life in ways scientists and policymakers are only beginning to understand. We’re also working with state agencies. For instance, the California Department of Fish and Wildlife is currently updating its master plan for fisheries management. Generally, the process looks at how to manage state fisheries across the board. This time, the plan will include a climate chapter. Officials are realizing that our CO2 emissions are affecting fisheries. California public agencies, from local to state levels, are looking at climate impacts from every angle: as they relate to fisheries management, coastal development, protected areas and other issues. And we’re trying to engage where appropriate. The Aquarium only has so much capacity, but we’re partnering and providing resources where we can to help ensure more efficient and effective decision-making related to climate. In January, the Aquarium and the California Latino Legislative Caucus held a briefing at the State Capitol on plastic pollution and its impacts on state waters. What issues resonated with those in attendance? Everyone seemed to agree that ocean plastic pollution is a big problem and that the most effective way to curb it is to stop it at the source. The solution won’t be as easy as beach clean-ups or filtering plastic out of the water. Instead, it’s going to take collaboration — especially among the policy, technology and management sectors — to find comprehensive solutions to reduce the sources of plastic pollution in the first place. The Aquarium successfully supported a statewide ban on plastic microbeads in personal care products, and a similar ban was enacted at the national level. What made the microbead campaign successful? The vials show the volume of plastic microbeads in different cosmetic products. Photo courtesy 5 Gyres. Second, we were able to say that there are alternatives. Just because plastic microbeads are removed from products doesn’t mean the products themselves have to go away. There are alternatives already on the market that work just as well and are economically similar. There was a solution right away. And then, we backed up our position with scientific findings that we’re seeing more and more of these microbeads in our local waterways. It goes beyond just being an environmental issue. We were able to talk about microbeads as a problem affecting water quality, wildlife and even human health. In 2014, the state Legislature passed a landmark bill restricting single-use plastic bags in California. But out-of-state plastic bag manufacturers gained enough signatures to put the ban on hold until November, when Californians will vote to either uphold or reject the law. How is the Aquarium supporting the measure? Executive Director Julie Packard shows off her reusable shopping bag. 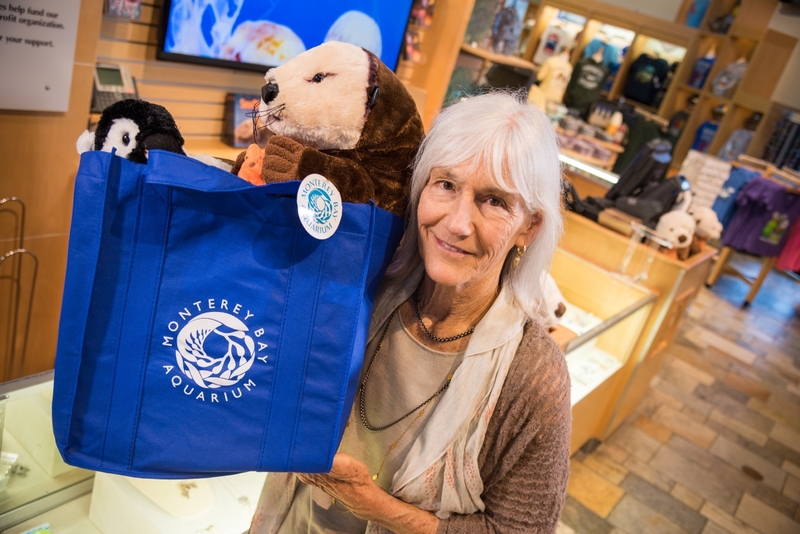 The Aquarium supports a referendum to uphold California’s ban on single-use plastic grocery bags. The complication with the bag ban referendum is that it’s confusing, and it’s not the reason people will come out to vote. Because it’s a presidential election year, a lot of voters will stop at the candidates. There’s a separate part at the end of the ballot for all these different public measures. We’re trying our best to remind people that they have to vote yes to keep the California law in place. Vote YES for a plastic-free ocean. For this one, we really can tell people, “You make a difference.” Your individual vote can keep this ban in place, and have a positive ripple effect. Since California is a leader, it’s likely to influence other states and the rest of the world. On March 15, the Aquarium will host an Ocean Day California reception in Sacramento. Why does the Aquarium host this event every year? It’s a platform to bring legislators and decision makers together, to offer them local, sustainable seafood and wine, and remind them that California’s ocean and coast are our greatest assets. Our goal is to encourage them to keep doing good work for the ocean. The Aquarium has credibility for being engaged on issues based on science, and we’re also inspiring our audiences— including state leaders — to conserve the ocean. Learn more about our Ocean Policy work. Overfishing: There’s a hack for that.